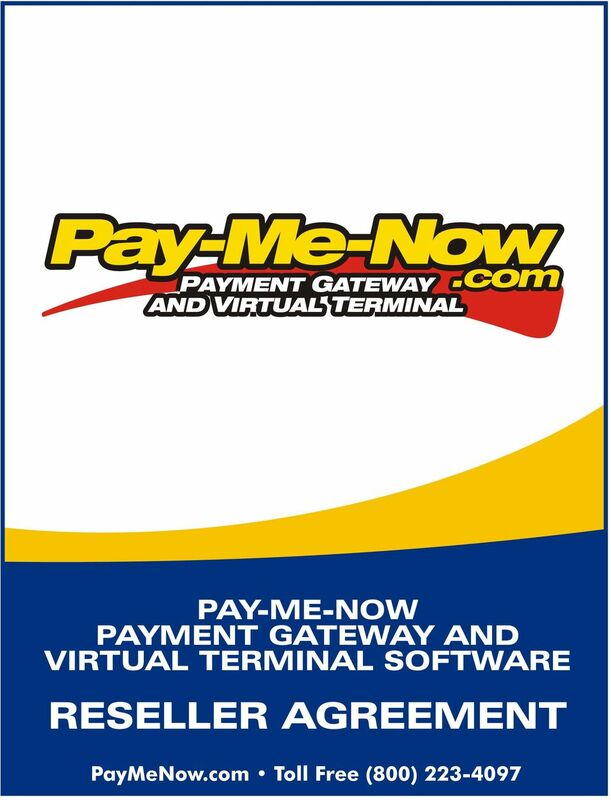 Download "PAY-ME-NOW PAYMENT GATEWAY AND VIRTUAL TERMINAL SOFTWARE RESELLER AGREEMENT. 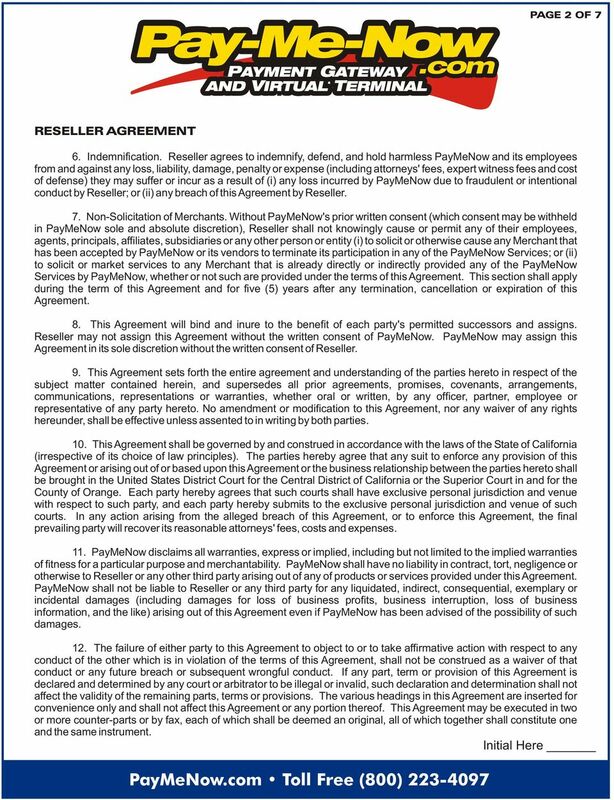 PayMeNow.com Toll Free (800) 223-4097"
2 PAGE 1 OF 7 This Reseller Agreement ( Agreement ) is made effective as of the date set forth below by and between Applied Merchant Systems, Inc. dba PayMeNow ( PayMeNow ) principally located at 1 N. Franklin, Suite 2360, Chicago, IL and the entity and/or individual whose name and address are set forth below ("Reseller ). WHEREAS, PayMeNow provides a payment gateway from Merchant Partners, LLC that processes credit card and automated clearing house ( ACH ) transactions for online merchants (the PayMeNow Services ) and PayMeNow wishes to expand its market share by retaining Reseller to assist in marketing its PayMeNow Services. NOW, THEREFORE, for good and valuable consideration, the receipt and sufficiency of which are hereby acknowledged, the parties agree as follows: 1. Appointment. PayMeNow hereby appoints Reseller as a non-exclusive reseller of the PayMeNow Services with a non-transferable right to promote, market and solicit orders for the PayMeNow Services from businesses wishing to utilize the PayMeNow Services ( Merchants ). Reseller shall identify prospective Merchants and will obtain all information and documentation reasonably required by PayMeNow. Reseller acknowledges that all Merchants are to be approved by PayMeNow in its sole discretion and Merchants will be able to utilize the PayMeNow Services effective only upon such approval. 2. Providing the PayMeNow Services. For all Merchants that are actively receiving the PayMeNow Services, PayMeNow shall provide the PayMeNow Services and maintain them in an uninterrupted and errorfree fashion consistent with its practices and reasonable industry standards. However, the parties understand that PayMeNow Services are a computer network based service which may be subject to occasional outages and delay occurrences. 3. Fees. Compensation to Reseller will be paid as set forth in the attached Exhibit A which is made a part of this Agreement. PayMeNow shall have the right to change the compensation plan as set forth in Exhibit A at any time in its sole discretion by providing thirty (30) days notice to Reseller. Residuals will be paid on approximately the 20th business day of the month following the month of collection. Residual payments due under $50 will be carried over and paid once residuals total $ Independent Contractors. The relationship of PayMeNow and Reseller is that of independent contractors. Neither Reseller nor Reseller's employees, consultants, contractors or agents are agents, employees, partners or joint ventures of PayMeNow, nor do they have any authority to bind PayMeNow by contract or otherwise to any obligation. 5. Term. The initial term of this Agreement shall be for a period of one (1) year, commencing on the date first set forth below. This Agreement shall thereafter be automatically renewed for additional terms of one (1) year each unless either party notifies the other no later than thirty (30) days prior to the end of the current term that it does not wish to renew this Agreement. Notwithstanding any other provision or term in this Agreement, either party may terminate this Agreement by providing the other party ten (10) days written notice. Reseller shall be entitled to receive compensation under this Agreement for so long as PayMeNow is receiving its corresponding compensation for such Merchant(s) unless Reseller commits a material breach of this Agreement which will terminate any further right Reseller has to receive compensation. 3 PAGE 2 OF 7 6. Indemnification. Reseller agrees to indemnify, defend, and hold harmless PayMeNow and its employees from and against any loss, liability, damage, penalty or expense (including attorneys' fees, expert witness fees and cost of defense) they may suffer or incur as a result of (i) any loss incurred by PayMeNow due to fraudulent or intentional conduct by Reseller; or (ii) any breach of this Agreement by Reseller. 7. Non-Solicitation of Merchants. 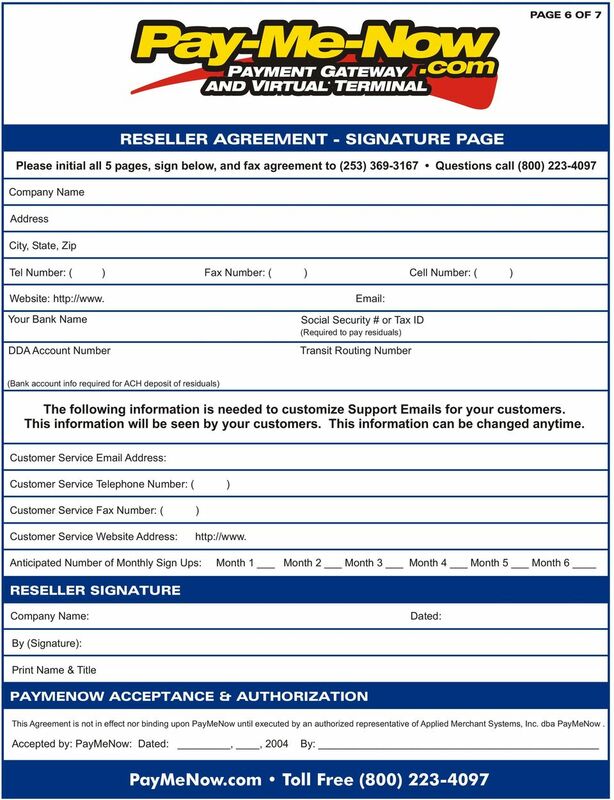 Without PayMeNow's prior written consent (which consent may be withheld in PayMeNow sole and absolute discretion), Reseller shall not knowingly cause or permit any of their employees, agents, principals, affiliates, subsidiaries or any other person or entity (i) to solicit or otherwise cause any Merchant that has been accepted by PayMeNow or its vendors to terminate its participation in any of the PayMeNow Services; or (ii) to solicit or market services to any Merchant that is already directly or indirectly provided any of the PayMeNow Services by PayMeNow, whether or not such are provided under the terms of this Agreement. This section shall apply during the term of this Agreement and for five (5) years after any termination, cancellation or expiration of this Agreement. 8. This Agreement will bind and inure to the benefit of each party's permitted successors and assigns. 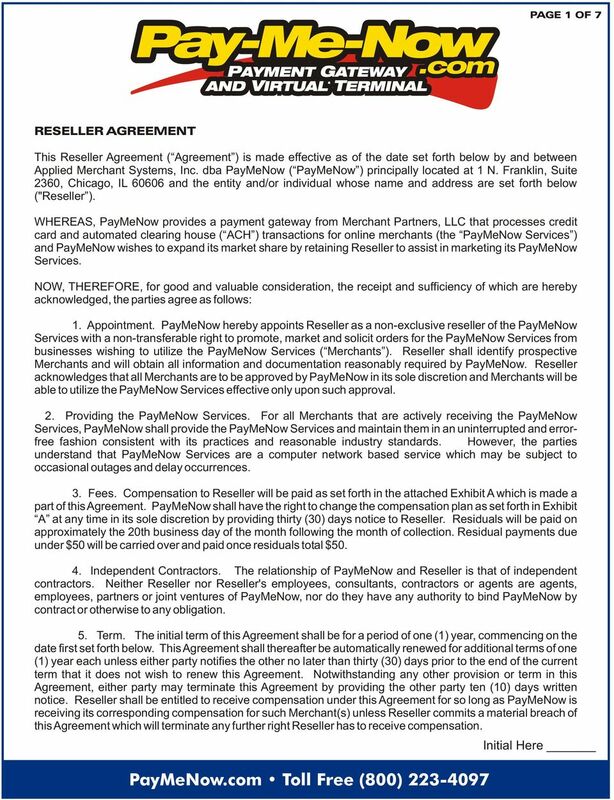 Reseller may not assign this Agreement without the written consent of PayMeNow. PayMeNow may assign this Agreement in its sole discretion without the written consent of Reseller. 9. This Agreement sets forth the entire agreement and understanding of the parties hereto in respect of the subject matter contained herein, and supersedes all prior agreements, promises, covenants, arrangements, communications, representations or warranties, whether oral or written, by any officer, partner, employee or representative of any party hereto. No amendment or modification to this Agreement, nor any waiver of any rights hereunder, shall be effective unless assented to in writing by both parties. 10. This Agreement shall be governed by and construed in accordance with the laws of the State of California (irrespective of its choice of law principles). The parties hereby agree that any suit to enforce any provision of this Agreement or arising out of or based upon this Agreement or the business relationship between the parties hereto shall be brought in the United States District Court for the Central District of California or the Superior Court in and for the County of Orange. Each party hereby agrees that such courts shall have exclusive personal jurisdiction and venue with respect to such party, and each party hereby submits to the exclusive personal jurisdiction and venue of such courts. In any action arising from the alleged breach of this Agreement, or to enforce this Agreement, the final prevailing party will recover its reasonable attorneys' fees, costs and expenses. 11. PayMeNow disclaims all warranties, express or implied, including but not limited to the implied warranties of fitness for a particular purpose and merchantability. PayMeNow shall have no liability in contract, tort, negligence or otherwise to Reseller or any other third party arising out of any of products or services provided under this Agreement. PayMeNow shall not be liable to Reseller or any third party for any liquidated, indirect, consequential, exemplary or incidental damages (including damages for loss of business profits, business interruption, loss of business information, and the like) arising out of this Agreement even if PayMeNow has been advised of the possibility of such damages. 12. The failure of either party to this Agreement to object to or to take affirmative action with respect to any conduct of the other which is in violation of the terms of this Agreement, shall not be construed as a waiver of that conduct or any future breach or subsequent wrongful conduct. If any part, term or provision of this Agreement is declared and determined by any court or arbitrator to be illegal or invalid, such declaration and determination shall not affect the validity of the remaining parts, terms or provisions. The various headings in this Agreement are inserted for convenience only and shall not affect this Agreement or any portion thereof. This Agreement may be executed in two or more counter-parts or by fax, each of which shall be deemed an original, all of which together shall constitute one and the same instrument. 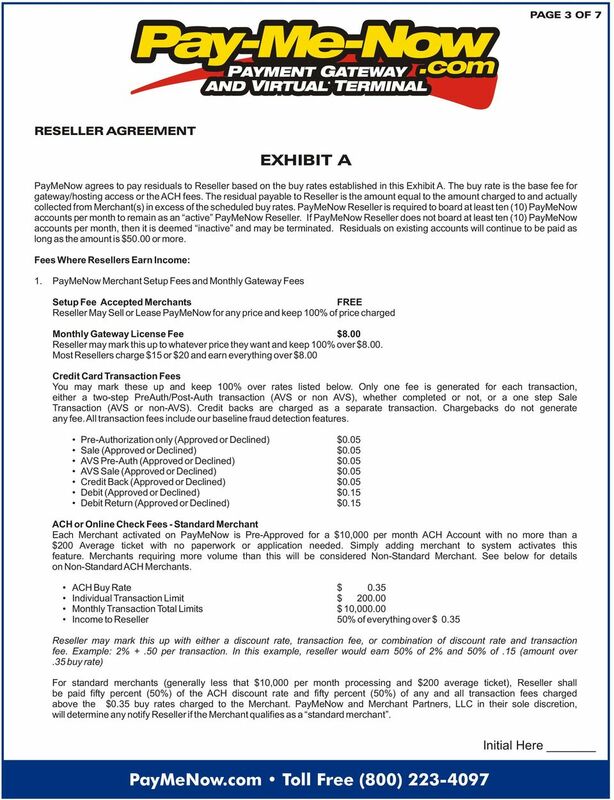 4 PAGE 3 OF 7 EXHIBIT A PayMeNow agrees to pay residuals to Reseller based on the buy rates established in this Exhibit A. The buy rate is the base fee for gateway/hosting access or the ACH fees. 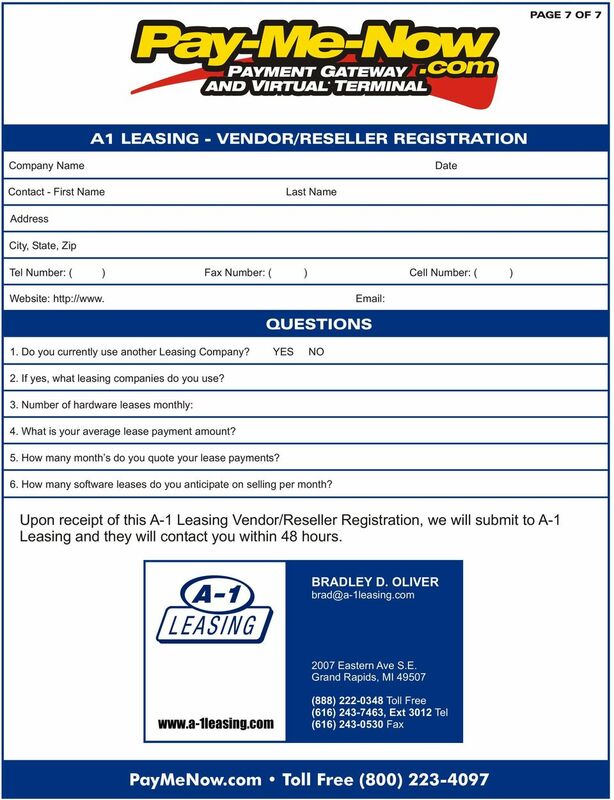 The residual payable to Reseller is the amount equal to the amount charged to and actually collected from Merchant(s) in excess of the scheduled buy rates. PayMeNow Reseller is required to board at least ten (10) PayMeNow accounts per month to remain as an active PayMeNow Reseller. If PayMeNow Reseller does not board at least ten (10) PayMeNow accounts per month, then it is deemed inactive and may be terminated. Residuals on existing accounts will continue to be paid as long as the amount is $50.00 or more. Fees Where Resellers Earn Income: 1. PayMeNow Merchant Setup Fees and Monthly Gateway Fees Setup Fee Accepted Merchants FREE Reseller May Sell or Lease PayMeNow for any price and keep 100% of price charged Monthly Gateway License Fee $8.00 Reseller may mark this up to whatever price they want and keep 100% over $8.00. Most Resellers charge $15 or $20 and earn everything over $8.00 Credit Card Transaction Fees You may mark these up and keep 100% over rates listed below. Only one fee is generated for each transaction, either a two-step PreAuth/Post-Auth transaction (AVS or non AVS), whether completed or not, or a one step Sale Transaction (AVS or non-avs). Credit backs are charged as a separate transaction. Chargebacks do not generate any fee. All transaction fees include our baseline fraud detection features. Pre-Authorization only (Approved or Declined) $0.05 Sale (Approved or Declined) $0.05 AVS Pre-Auth (Approved or Declined) $0.05 AVS Sale (Approved or Declined) $0.05 Credit Back (Approved or Declined) $0.05 Debit (Approved or Declined) $0.15 Debit Return (Approved or Declined) $0.15 ACH or Online Check Fees - Standard Merchant Each Merchant activated on PayMeNow is Pre-Approved for a $10,000 per month ACH Account with no more than a $200 Average ticket with no paperwork or application needed. Simply adding merchant to system activates this feature. Merchants requiring more volume than this will be considered Non-Standard Merchant. See below for details on Non-Standard ACH Merchants. ACH Buy Rate $ 0.35 Individual Transaction Limit $ Monthly Transaction Total Limits $ 10, Income to Reseller 50% of everything over $ 0.35 Reseller may mark this up with either a discount rate, transaction fee, or combination of discount rate and transaction fee. Example: 2% +.50 per transaction. In this example, reseller would earn 50% of 2% and 50% of.15 (amount over.35 buy rate) For standard merchants (generally less that $10,000 per month processing and $200 average ticket), Reseller shall be paid fifty percent (50%) of the ACH discount rate and fifty percent (50%) of any and all transaction fees charged above the $0.35 buy rates charged to the Merchant. PayMeNow and Merchant Partners, LLC in their sole discretion, will determine any notify Reseller if the Merchant qualifies as a standard merchant. 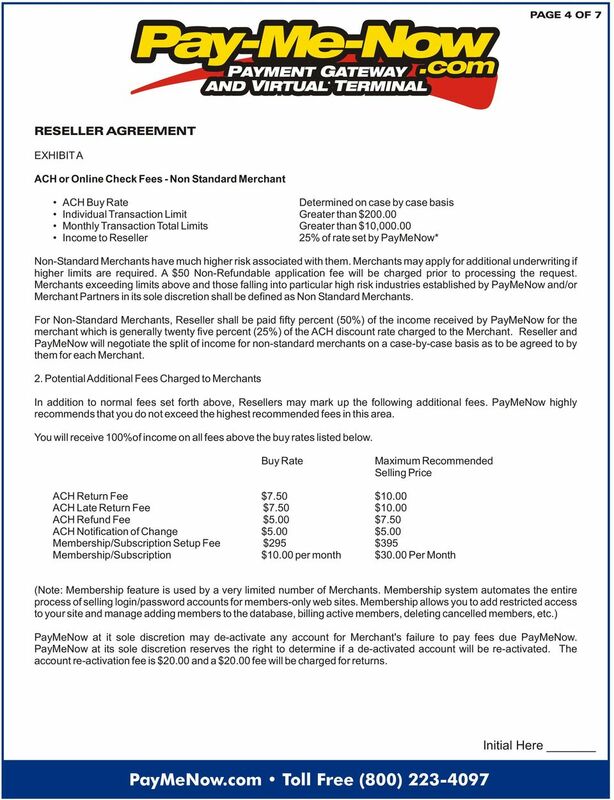 5 PAGE 4 OF 7 EXHIBIT A ACH or Online Check Fees - Non Standard Merchant ACH Buy Rate Determined on case by case basis Individual Transaction Limit Greater than $ Monthly Transaction Total Limits Greater than $10, Income to Reseller 25% of rate set by PayMeNow* Non-Standard Merchants have much higher risk associated with them. Merchants may apply for additional underwriting if higher limits are required. A $50 Non-Refundable application fee will be charged prior to processing the request. Merchants exceeding limits above and those falling into particular high risk industries established by PayMeNow and/or Merchant Partners in its sole discretion shall be defined as Non Standard Merchants. For Non-Standard Merchants, Reseller shall be paid fifty percent (50%) of the income received by PayMeNow for the merchant which is generally twenty five percent (25%) of the ACH discount rate charged to the Merchant. Reseller and PayMeNow will negotiate the split of income for non-standard merchants on a case-by-case basis as to be agreed to by them for each Merchant. 2. Potential Additional Fees Charged to Merchants In addition to normal fees set forth above, Resellers may mark up the following additional fees. PayMeNow highly recommends that you do not exceed the highest recommended fees in this area. You will receive 100%of income on all fees above the buy rates listed below. Buy Rate Maximum Recommended Selling Price ACH Return Fee $7.50 $10.00 ACH Late Return Fee $7.50 $10.00 ACH Refund Fee $5.00 $7.50 ACH Notification of Change $5.00 $5.00 Membership/Subscription Setup Fee $295 $395 Membership/Subscription $10.00 per month $30.00 Per Month (Note: Membership feature is used by a very limited number of Merchants. Membership system automates the entire process of selling login/password accounts for members-only web sites. Membership allows you to add restricted access to your site and manage adding members to the database, billing active members, deleting cancelled members, etc.) PayMeNow at it sole discretion may de-activate any account for Merchant's failure to pay fees due PayMeNow. PayMeNow at its sole discretion reserves the right to determine if a de-activated account will be re-activated. The account re-activation fee is $20.00 and a $20.00 fee will be charged for returns. 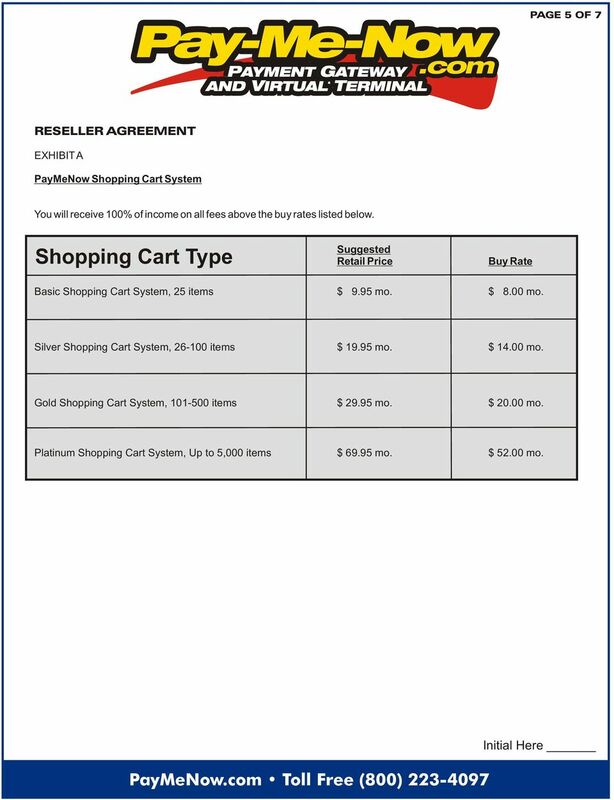 6 PAGE 5 OF 7 EXHIBIT A PayMeNow Shopping Cart System You will receive 100% of income on all fees above the buy rates listed below. Shopping Cart Type Suggested Retail Price Buy Rate Basic Shopping Cart System, 25 items $ 9.95 mo. $ 8.00 mo. Silver Shopping Cart System, items $ mo. $ mo. Gold Shopping Cart System, items $ mo. $ mo. Platinum Shopping Cart System, Up to 5,000 items $ mo. $ mo.